One of the most common uses of the if statement is to make a simple selection. When the user takes a particular action, something happens. In the following example, when the user clicks OK in the confirm dialog box, the application displays the secret message. // Create an expression that results in true or false. // Test the expression using the if statement. In this case, Answer can contain only true or false because confirm() doesn’t output any other values. As a consequence, you don’t need to perform any sort of value checks on Answer — all you need to do is determine the truth value of Answer to make the decision. All decision making expressions that you ever create will have a truth value of some sort — either true or false. Sometimes the truth value is hidden, as when working with the switch structure, but the truth value is there. Computers don’t understand anything other than true or false. There are techniques that make it appear that the computer can do something else, but in reality, it all comes down to making a true or false decision as shown here. What else can you do with the if statement? You use the if statement in situations when an application needs to do something when the user responds correctly, but ignore the input when the response is incorrect. However, there are times when you must do something when the input is correct and something else when it’s incorrect. In this case, you add the else clause to the if statement as shown in the following example. // Perform an alternative task. A clause is an extension of a structure. In this case, the else clause extends the if structure to include a second code block that handles the false condition. The example still outputs the secret message when the user clicks OK in the confirm() dialog box. However, now the code also displays an alert() dialog when the user clicks Cancel. This secondary action helps the user understand how to react to the confirm() dialog box to obtain a different output. 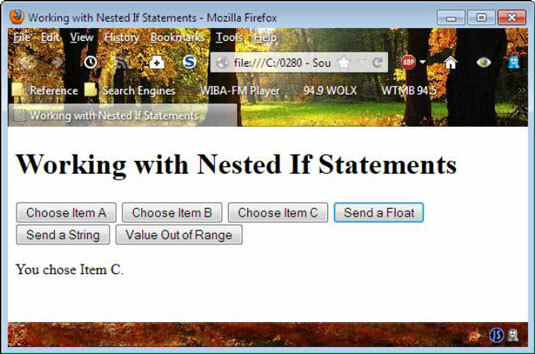 There are many reasons why you might nest if statements — that is, place one if statement within another. In this case, the user selects an option onscreen, CheckChoice() performs a check of that option, and then CheckChoice() displays the correct result onscreen. The nested if statement is almost anticlimactic at this point. You know that Select contains 1, 2, or 3. The first if statement checks for a value of 1 and displays a message when it finds that value. When the value is something other than 1, the else clause takes over. Within the else clause is a nested if statement. This if statement checks Select for a value of 2 and displays the appropriate message when it is. When Select is 3, the else clause of this second, nested, if statement displays the appropriate message.